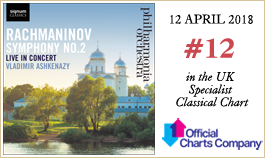 Rachmaninov’s ebullient Symphony No 2 in E minor bursts into new colour in a live recording from London's Royal Festival Hall. It was not until the second half of the last century that Rachmaninov began to be taken seriously as a composer. Previously, all that was well known of his work were his piano concertos (the Second and Third in particular) and a handful of piano pieces—the best-known being the celebrated C sharp minor Prelude, which he wrote when he was still in his teens and went on to despise in later life. Nowadays his piano music is no longer regarded as fodder for virtuosos with strong fingers and weak intellects, and his symphonic music is treated with due respect. But one area of his output is still little-known: his operas. Rachmaninov worked for several years as an opera conductor and gave the first performances of two of his own operas at the Bolshoi Theatre in the spring of 1906. Immediately after these performances, however, he resigned from the staff of the Bolshoi and went off to Italy with his family, intending to escape the political unrest in Russia. But work proved difficult: Rachmaninov had hoped to begin another opera, based on Flaubert’s novel Salammbô, but wranglings over the libretto forced him to abandon the idea. His young daughter, Irina, was unwell and in the autumn the family returned to Russia—but not for long. They set off almost immediately for Dresden, where they spent a few months of each subsequent year living in relative peace and seclusion. Rachmaninov was able to concentrate once again on composition. He began work on yet another opera, this time based on a play by Maeterlinck, Monna Vanna; and—in secret—on another symphony. Perhaps he kept the symphony under wraps because he was still sensitive about the dismal reception of his First Symphony. Whatever the reasons, not even his friends knew about it until they read about it in a newspaper. In fact, all this was true. Rachmaninov began work on the orchestration of the Second Symphony in the summer of 1907, immediately after the birth of his second daughter, and finished it shortly before the first performance, which he conducted himself in St Petersburg early in 1908. The Glinka Prize committee awarded Rachmaninov the 100-rouble first prize for the symphony that same year; Scriabin came second with Le poème de l’extase. The symphony opens with a long, brooding slow introduction. It is in an arch shape, rising from the darkness of a motto theme in the cellos and basses, reminiscent of Russian Orthodox chant, to a passionate climax and then subsiding again into the gloom. A recitative for the cor anglais ushers in the allegro, a large-scale sonata movement built principally upon the violins’ first subject, which manages to soar and drive forward simultaneously. A solo clarinet introduces a new tune, taken up by the strings, consisting of falling sequences—one of Rachmaninov’s melodic trademarks. There is one more theme in the exposition, a radiant, lyrical tune for the cellos. The tempestuous development section rises to first one climax and then another, even louder and more dissonant. The recapitulation dwells more on the gentler material, music that seems the more passive after the storms of the development. The scherzo opens with a swaggering theme for horns, with the violins articulating another of Rachmaninov’s trademarks, a dactylic rhythm driving the music forwards. There is a contrasting lyrical second theme, a brief respite from the galloping opening subject, and then a central section, which—like the motto theme that opens the symphony—sounds like a Russian Orthodox procession. The adagio is the lyrical heart of the symphony. 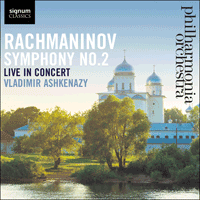 Here Rachmaninov is at his romantic greatest, writing passionate and intense music, at once yearning and nostalgic. The clarinet melody—one of the greatest tunes of the 20th century—is accompanied by a remarkable texture, created by dividing the strings into no less than 16 independent parts. The movement is in sonata form, with a second subject group made up of a series of questions and answers for the woodwinds and a brief development section. But this wonderful music defies analysis, in that its beauty lies in the seemingly endless melody that Rachmaninov spins. The adagio ends in a mood of quiet resignation, at once positive and melancholy. After that, the finale bursts in with an opening march-like theme, bristling with bravura energy. The triplets, which are such a distinctive feature of the theme, drive the music forward in a headlong gallop. A cymbal crash and a brass fanfare introduce the effulgent second subject, which ends with a peaceful reminiscence of the adagio. After a less serene but still good-humoured development, the recapitulation is introduced by a huge crescendo, beginning with a downward scale on the bassoon. The whole orchestra eventually joins in—even the glockenspiel—before the march theme makes its triumphant return. The recapitulation of the second subject is topped off by a final return of the motto-theme, and a whirlwind coda brings the symphony to a joyous conclusion.